Airiam is dead, the crew are in mourning and, at her funeral, they are in full attendance including a recently freed detainee in the form of Tyler. A select few of the Bridge crew got to say a farewell comment to Airiam before her body is shot out of a torpedo tube very much akin to Spock’s funeral in Wrath of Khan. Whilst preparing Airiam for her funeral and purging her system of the Control virus, Tilly finds a bio-neural scan of the Red Angel within Airiam’s code and it is revealed that the DNA is that of Burnham. And I’ll take you back to Episode 6 that when the Red Angel made itself known to Saru’s highly capable eyes, that the figure of the Red Angel definitely appeared to me to be female, so this lead me to predict it must be Burnham just before Tilly announced that it was indeed Burnham to Pike, (a stunned) Burnham and Cornwell. A lot happens in this episode that either concludes or reignites smaller stories in previous episodes, in a debrief between Leland and Burnham, we learn that Section 31 are fully aware of the Red Angel’s suit because they built it twenty years ago to combat a temporal-arms race with the Klingons. Leland then reveals to Burnham that her parents were part of the project and he was the one that caused her parents death’s and she subsequently punched him hard in the face, once for Mum and again for Dad. Culber finds relationship answers in the most unlikely of allies in the form of Cornwell who advises Culber “Love is a choice… and one doesn’t just make that choice once. One makes it again and again.” And that “The only way to make a new road is to walk it”. Culber is starting to find himself again, which is great, but is Stamets willing to be found again? Tyler and Burnham reconcile, and Burnham and Spock continue to work on stabilising their sibling rivalry. A plan is devised to capture The Red Angel to find out why The Red Angel is appearing at events where Burnham’s life is being threatened and saving the day. They choose Essof IV, a planet where the atmosphere is inhospitable to human life and Burnham becomes the bait. To snare The Red Angel completely, Section 31’s ship will close the wormhole that The Red Angel uses to jump time and Stamets team will build a suitable trap to capture the Red Angel. All goes well with Burnham being subjected to the unbreathable atmosphere and the rest of the crew watch as she endures a long drawn out agonising death with Culber waiting to revive her at a 42% oxygen level. 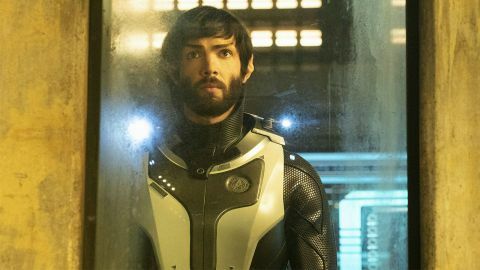 Spock realises that whilst she is dying, Burnham wants to go through the complete process and denies Culber and Stamets access to halt the capture. Burnham dies. All through this, Tilly is monitoring the important Tachyon levels that exist when The Red Angel is around, and low and behold, just as Burnham dies, the Red Angel appears, Section 31 closes the wormhole and Stamets team capture the Red Angel just after The Red Angel revives Burnham. The human figure falls out of the Red Angel biometric suit and it is revealed that it is Burnham, Mother Burnham whose death Leland had said he’d caused. And talking of Leland, he is stabbed in the eye by a rogue retinal scanner under the control of Control, the episode ends before we find out if he is dead or just blinded. VERDICT: I rate this episode 10 out of 10 because this episode is the episode that keeps on giving. All the relationship issues both in love, war and family are prevalent throughout. Again, The Red Angel’s storyline is advanced, but we still get teased with the lack of dialogue and the cliff hanger of Ma Burnham. I’m sure in the next episode (or two) we will find out what exactly happened to Burnham’s parents and I also hope that Culber and Stamets reconcile and get back together because Stamets is lost without Culber and vice versa. Georgiou’s character briefly becomes maternal to Burnham in a conversation and whether this is a stabiliser for the appearance of her mother later in the episode or not, I’m just not too sure. I love that, at, two thirds of the way through the season that the actors are settled and comfortable within their characters. I can’t possibly tell you who my favourite is because they all bring great qualities to the fold. I particularly hope that Pike will remain the Captain in the next season as he is just glowing and rapidly becoming my all-time favourite Captain. Anson Mount, I salute you sir. I particularly love Tilly’s ever developing comedic delivery, and the all-new-Saru, far removed from the wouldn’t-say-boo-Saru. It is also worth mentioning, again, that Sara Mitich, who I mentioned was once playing Airiam and now is Lt Nilsson, becomes the new Sporedrive Ops Officer on the bridge replacing Lt Airiam later played by Hannah Cheesman. This episode is full of greatness and the best episode in the season so far. The series finale teaser of Gotham is here!